According to global IPO investment advisor Renaissance Capital, 61 IPOs were priced in the US during the 2nd Qtr of 2018, while the volume of capital raised totaled $13.1 bln during the period, 23.6% higher than the amount of new capital raised in the 2nd Qtr of last year. According to Renaissance Capital, the number of new deals that were priced during the 2nd Qtr of 2018 surged 17.3% to 61 deals when compared to the same period last year, and represents a 38.6% surge in new deals from the 1st Qtr of 2018. The 2nd Qtr 2018 results marks the highest number of IPOs during the 2nd Qtr since 2015 when 70 IPOs were priced. During the first six months of the year, 105 IPOs were priced – 36.4% higher than seen in the first half of last year. The amount of new capital raised in the 2nd Qtr of 2018 rose 23.6% to $13.1 bln when compared to the same period last year, marking the highest quarterly new capital total since the 2nd Qtr of 2014 when $20.8 bln was raised. The new capital raised in the 2nd Qtr of 2018 represents a 15.5% decrease over the capital raised in the previous quarter. During the first six months of the year, $28.6 bln in new capital was raised – 39.6% higher than seen in the first half of last year. During the 1st half of the year, more than one-third of the IPOs (36%) came from the healthcare sector; whereas 28% of all deals priced came from the technology sector. IPOs priced in financials totaled 11%, while 8% of all deals priced came in the consumer discretionary sector. The largest offering during the 2nd Qtr in terms of proceeds, was AXA Equitable Holdings Inc. EQH, which spun out of French insurance company AXA SA CS. The company, which makes up AXA’s US operations, raised $2.7 billion in its debut. GreenSky Inc., a Fintech company that enables loans at the point of sale, and BJ’s Wholesale Club Holdings Inc. were next on the list, raising $874 million and $638 million in new cash, respectively. 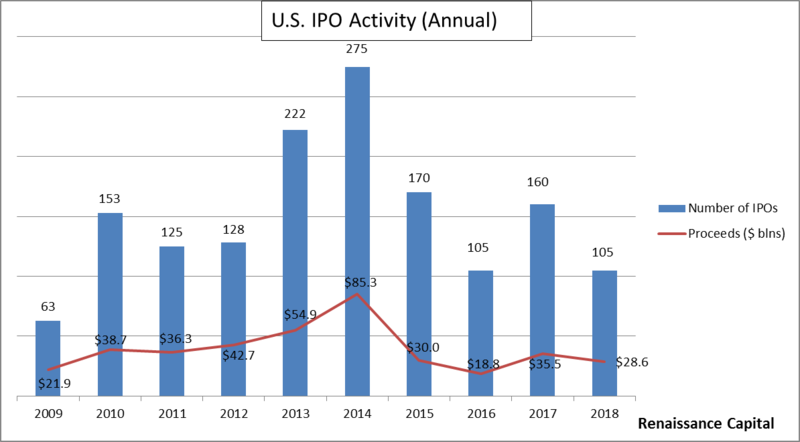 Through the first six months of this year, 123 new IPOs have been filed, 35.2% higher than what was recorded during the same period last year. IPO performance posted slightly weaker returns than the overall market during the 2nd Qtr. The Renaissance IPO Index rose 4.45% during the 2nd quarter compared to a 4.49% gain in the S&P 500 Index during the same period. However, over the first half of the year, IPOs outperformed the equity market as the Renaissance IPO Index rose 5.74% during the first six months of 2018, compared to a 2.56% rise in the S&P 500 Index during that period. Strong US IPO activity during the 2nd Qtr of 2018 is not a surprise to most analysts as increased confidence in the U.S. economy, healthy performance from IPOs, the pro-business climate of the current administration, and continued low interest rates have all been encouraging signs to corporate executives. Consequently, many analysts expect the robust IPO performance seen over the first half of the year should continue throughout the remainder of 2018. The projected pickup in 2018 IPO activity should be a boost to earnings at many investment banks. The big question is whether this renewed IPO activity will be able to offset the weakness seen in cash equity trading and research revenue at many banks caused by the onset of MiFID II. However, we suspect that the strength in healthcare and technology IPOs could encourage some sell-side firms to boost hiring research analysts, particularly in these high-demand sectors.